Spicy Pickles & Pork Sammy | sandwich surprise! 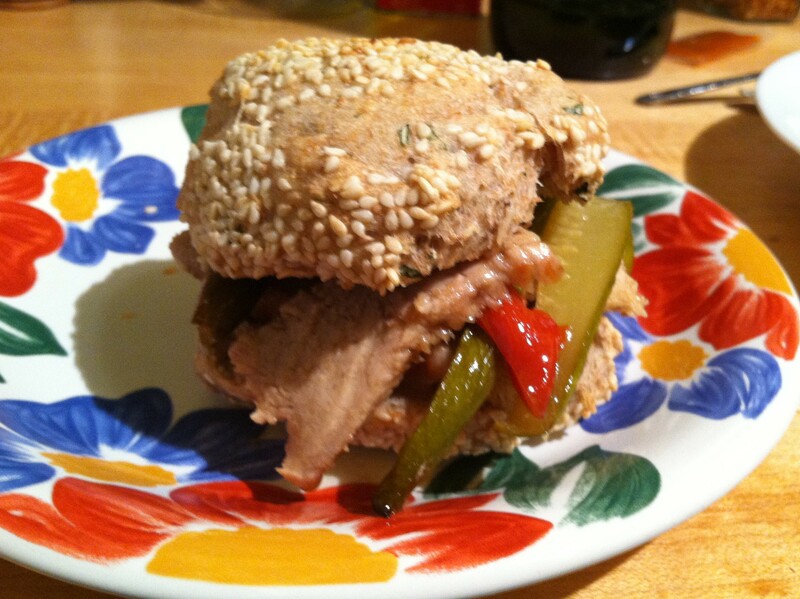 The Sandwich Surprise: Fall is a terrific time for Spicy Pickles & Pork on a Sesame Basil Roll. Also, Le Bernardin’s bread basket includes these amazing sesame basil rolls. Le Bernardin is one of the things that keeps me happily in NYC. And like everything else on their menu, it was an eye-opening flavor combo — but this one is actually doable at home! Pork chops on the bone: I asked the butcher for the ones with the most fat on them, so there would be more porky goodness to meld with the pickle juice. 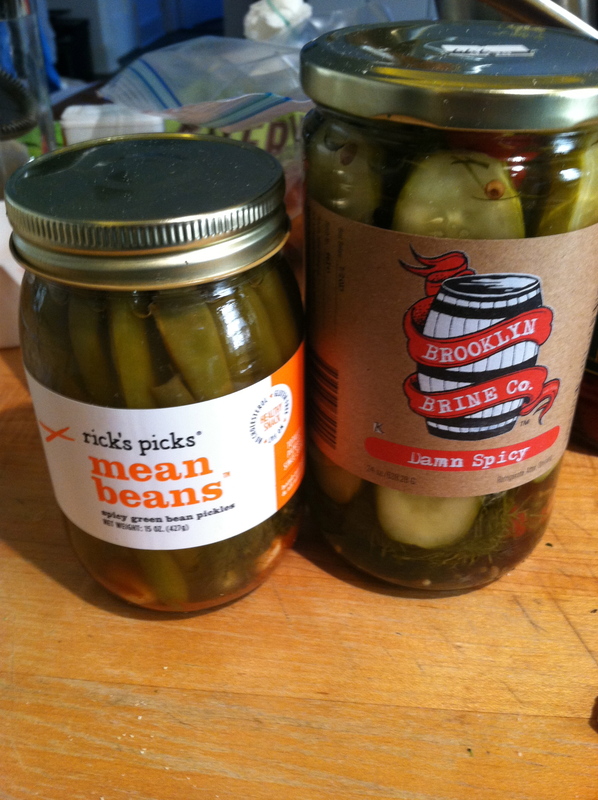 Rick’s Mean Beans and Brooklyn Brine Co. Damn Spicy pickles. My friend Erika, who’s an actress, model and singer. You can check Erika out at her site or occasionally at Don’t Tell Mama in the Theater District, where “Natural Woman” by Carole King is one of the stars of her repertoire. They’re actually vegan, as well as dairy-, egg- and gluten-free! 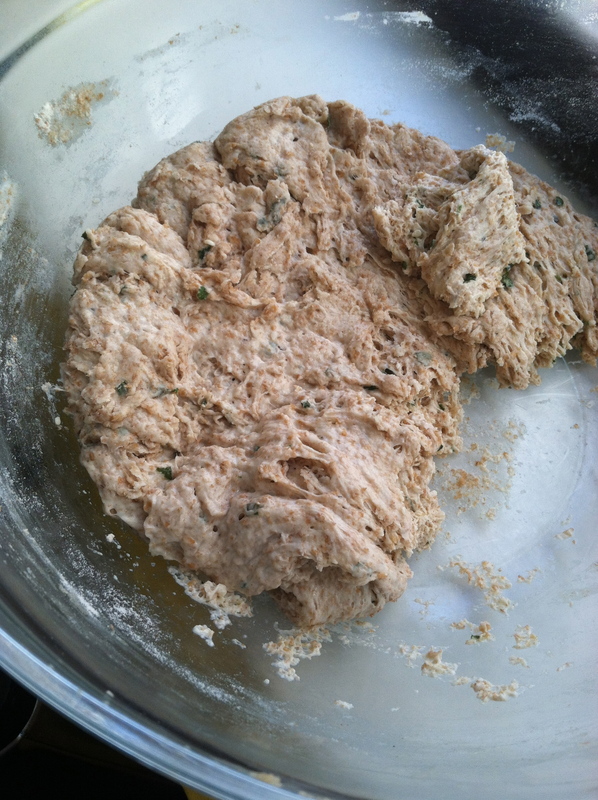 The base dough is made by Eat Pastry; I just added the nuts and spice. Coat an iron frying pan with olive oil, and heat for a couple minutes on a medium-high flame. Brown two pork chops on each side for 4-5 minutes. I like to brown the edges too for 1-2 minutes. Then pour half a jar of spicy pickle juice in the pan, along with the Mean Beans and the Damn Spicy pickles (sliced lengthwise) around the chops in the pan. It’s cool if some of the veggies are on top of the meat. Place the whole pan in the oven for 30 mins. After that, check the middle of each chop to make sure they’re not pink. If there’s still pinkness, return to oven for a couple more minutes. Otherwise, slice lengthwise and layer meat and veggies on your rolls. 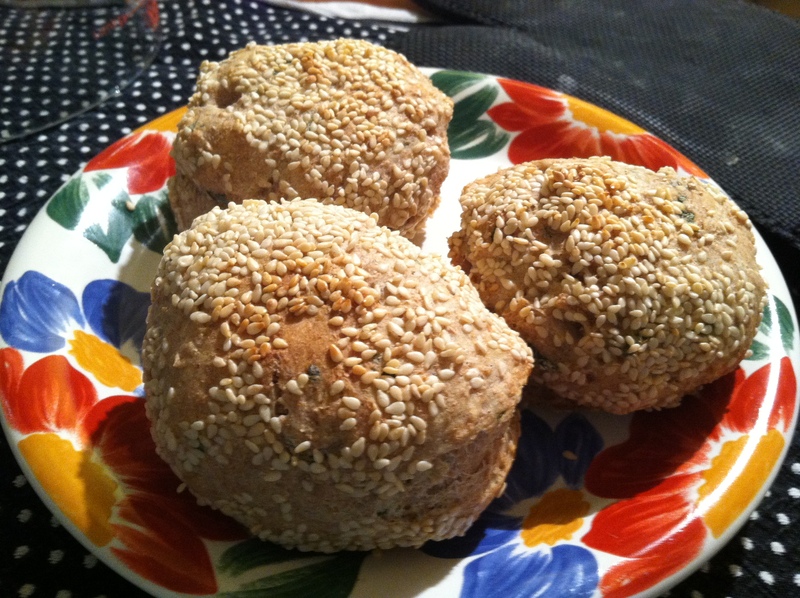 For the rolls, go to Le Bernardin (any excuse is a good one), or buy sesame seed rolls from the store. 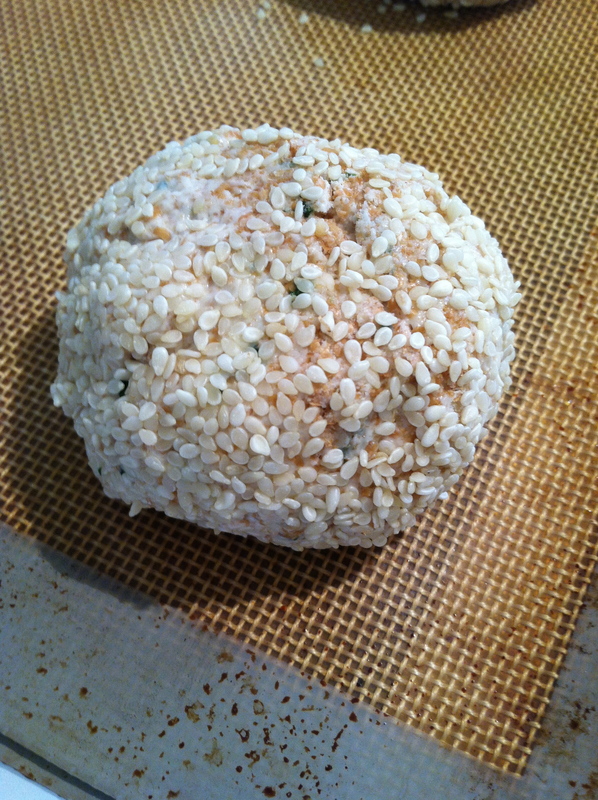 I let that rise for two hours, then I formed balls the size of small oranges and rolled each in a bowl filled with raw sesame seeds. I baked the rolls, 6 to a sheet, for about 16-20 mins, flipping them at the 12 minute mark. *Let’s Lunch is a fun group of food bloggers from all over the world. We have a virtual lunch date every month via Twitter (#letslunch) and share each others’ food adventures on a new topic each time. 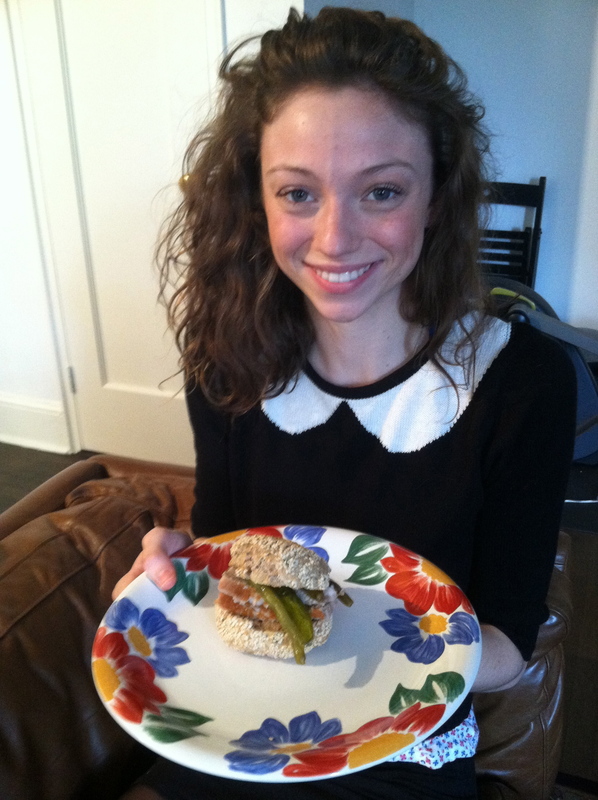 Here are the other Let’s Lunchers’ pickle posts! Please check here for more pickle-themed links to Let’s Lunch’s bloggers, as I’ll update them all day! 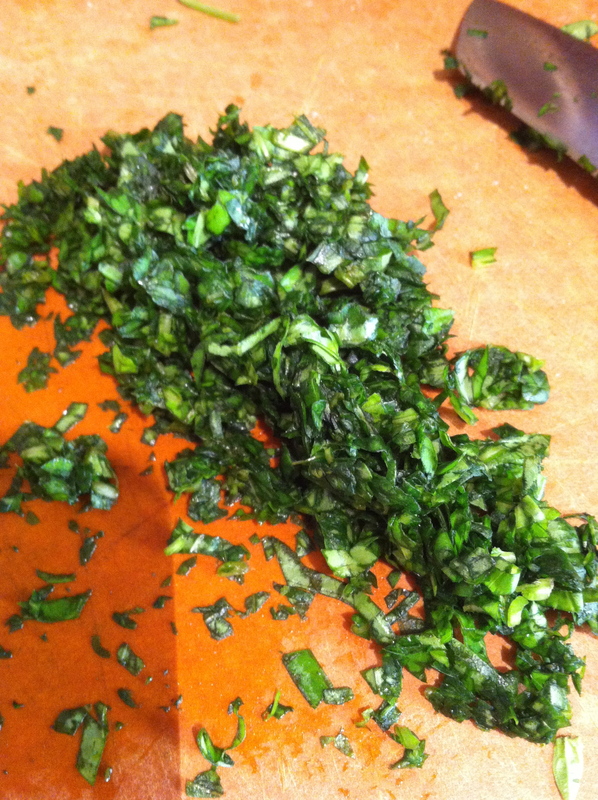 Pingback: Glass of Fancy » Blog Archive » Quick Chinese Spicy Cucumbers - Fashion, fiction, and life in the city. I love Rick’s Mean Beans (also the Smokra); pork sounds like an ideal sandwich combination! This is the first time I’ve tried any of Rick’s offerings. I’ll definitely look into the Smokra—okra, mmmm—so thanks for the tip! Thanks, Joyce — wish you were here to try some! You must be everyone’s best friend. Who else serves sandwiches on homemade buns with cool hot fillings? Honestly. 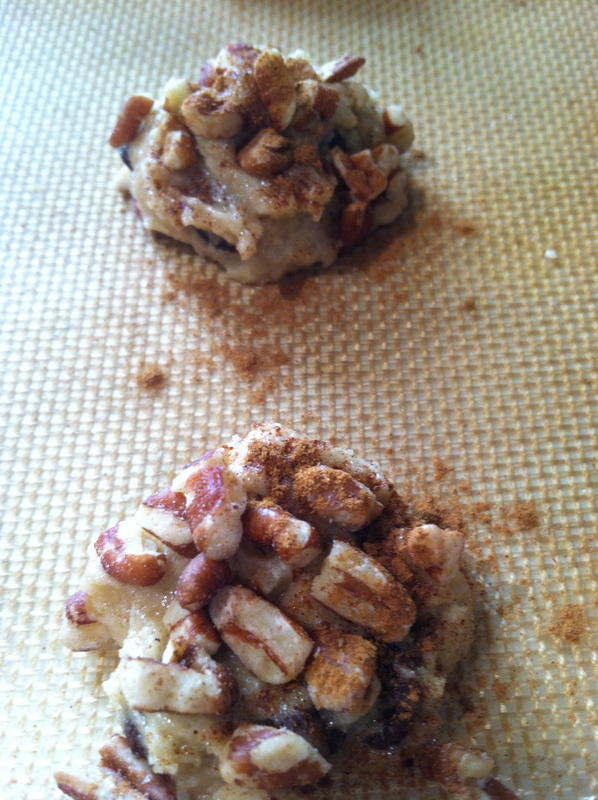 Gluten free cookie dough ftw!